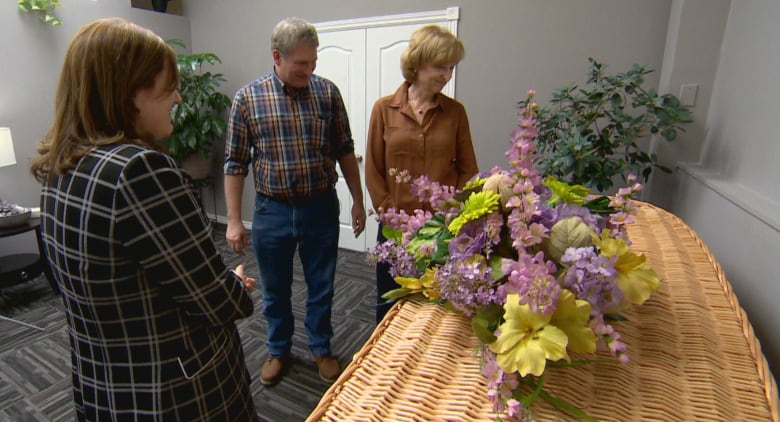 Lion Lamb Blog -- David Mundy: The Cheerful Boomer Funeral? In recent weeks I've attended two funerals where I was a congregant rather than presider, one for my step-mother-in-law and the other for a dear family friend who was in his 95th year. One was in a church, the other in a funeral home. Both were Christian funerals conducted with dignity, yet there was laughter and fond memories at each. I felt that it was important to be there, and with the family friend I drove a couple of hours each way to be present. I'm glad I did. Forget the dimly lit, sombre mood of an old-fashioned funeral home. Consider instead a cocktail party-style celebration of life, complete with hors d'oeuvres and a video tribute. Ashes in an urn? Try a teapot, or a toolbox instead. Canadians' ideas about what should happen after they die are becoming more creative and custom-designed to the individual. And that means businesses both big and small are racing to meet new demands. "We're a generation that's not traditional," said Krystal Riddell, a funeral director from Niagara Falls, Ont. Late last year, Riddell launched Essentials Cremation and Burial Services in a bright, modern space located in a strip mall. The tone of the article is that the fusty services, perhaps by implication religious, are being replaced by an innovative post-war generation. Hmm. First of all, there aren't many dimly lit funeral homes in my experience, which was more than 500 funerals and memorials through the decades. And interestingly enough, during my ministry there was a shift back to church funerals, when appropriate. I've had many younger family members who are "unchurched" comment on the beauty and tranquility of church sanctuaries even though they don't attend Sunday worship and never did. I presided at a church memorial in my final year of ministry for a lovely woman in her nineties. She had been cremated and the "urn" was a an old wooden cigar box, which her father or husband had sanded and refinished years before. There was also a lot of music, sacred and not-so-sacred but evoking fond memories. Family members spoke lovingly, and this Christian service was also a marvelous tribute to an individual who had touched the lives of many. In the rather sunny description of Boomer services Buckner mentions the "memorial to be held later" after cremation. Well, talk to funeral directors. Many lament the containers of the supposed beloved family members remains cluttering shelves in their establishments that folk never come to pick up, despite repeated requests. Or they describe the conversations with grieving partners and children who admit that not having a service where loss is acknowledged has them stuck in sadness. Hey, I'm a strong supporter of having funeral and memorial services which are personal, loving, and hopeful. I also support less expensive and greener options. But Baby Boomers (and I are one!) don't get everything right despite our general conviction that we invented the world. I figure we are an aging and death-denying bunch, and it may be to the detriment of those we leave behind. Nothing fancy for me. When the time is right - and I hope it's many, many years from now - it'll be a matter of taking a long walk on a short dock. That's it. Thanks for coming. A shallow grave and a bag of lime it is Roger! Is There a Chaplain in the House? 'Til Death Takes Us Together?